Apart from Proxification Rules you can set proxification options manually for certain applications. 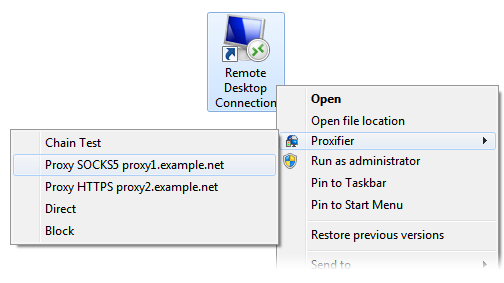 When Proxifier is installed and running, Windows adds a “Proxifier” command to the exe-file context menu. The “Proxifier” submenu shares the same actions with the Proxification Rules. You can select a proxy or a chain, block connections or process them directly. When an instance of the Proxifier application is started with the “Proxifier” command, all other rules are ignored for this instance. Please note that the “Proxifier” command is only available for exe-files or shortcuts (lnk-files) that point to exe-files. Different versions of Windows can use different kinds of surrogate shortcuts that technically are not links to exe-files. If you do not see the “Proxifier” command in the context menu of an application, it is recommended that you find its executable file and create a direct link to it. On Windows 7, to display the context menu for application icons located on the task bar, hold down the “Shift” key when you right-click on them. Another problem can be caused by applications that use launchers and multiple instances. If you start a program that starts another one, only the original one will be processed accordingly to the “Proxifier” command. A good example of this is Internet Explorer. When Protected Mode is enabled it starts a new instance of its own each time you run it so you cannot perform manual proxification for it.